A great way to keep healthy salads interesting is to switch up your dressing options. I like making homemade dressings because it is an awesome way to cut calories while still providing a delicious dressing. 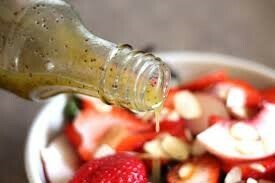 Often, making homemade dressing also tastes better because the taste is fresher. Some of these recipes do call for some pre-made ingredients, such as dip mix and most call for mayonnaise as a base. The recipes can be made healthier by using a lower calorie or lower fat mayonnaise. With almost all dressing recipes, using vinaigrettes and citrus based dressing are healthier, but eating salad with dressing is better than no salad at all so if you want a creamy dressing, go for it. Another tip for preparing salad’s as a side, I find that when I load a salad up with colorful ingredients like chopped tomato, snap peas, carrot shreds, even boiled egg, my palate doesn’t need as much dressing. Differing textures also help keep salads interesting! Some helpful hardware when making salad dressings are a plastic or glass container for storing the dressing, that needs a sealing top, this can also be used for shaking together some recipes.. Some recipes call for a blender, and often an immersion blender will do just as well. Growing up we had a Tupperware shake container, the clear cup with a rubber top, and inside was the weird piece that looked like it could have come out of our spirograph game, those can still be found online and they work great too. The more modern dressing containers have pour spouts, and funky mixers in them, and work swell too. Cafe Rios Ranch Dressing Recipe This dressing is a little bit sweet, a little tang, with a little kick. You can add more jalapeno to spice it up, if desired. This is great on salad and is great on chicken burgers, in pitas and would make a great dip for cucumbers. Classic Ranch dressing. Great for everything from salad, to burgers, to dipping chicken. Ranch goes with pretty much everything! Thousand Island Dressing This dressing is a crowd pleaser, it goes great with salads, as a zip, and is awesome on a Cali burger. Creamy Poppy Seed DressingThis dressing is refreshing and light, the combination of lemon and poppy seed is a classic combination, the apple cider vinegar adds a light touch while the lemon adds a pop of flavor. This dressing would be great on a simple wedge salad. Raspberry Vinaigrette This recipe makes a large batch. The vinaigrette is a great, healthy alternative to creamy dressings, and you won’t miss the creaminess because the dressing is packed with flavor. It is not only great on salads, but can be used to marinate chicken, or even dip chicken tenders in. Citrus Vinaigrette This dressing is light and refreshing, the citrus is a great way to dress any salad, and reminds me of summer! Try with almonds, mandarin, and dark spinach. If you are trying to watch your figure or are health conscious, here are additional tips. While at a salad bar, or preparing your own salad, the calorie whoppers are typically craisins and raisins, which are packed with sugar; sugar glazed nuts; croutons and crunchy tortilla shell bowls as well as going overboard on cheeses. A tip for keeping calories in check with your dressing, if you really want that creamy ranch or bleu cheese, ask for it on the side, and just dip the tines of your fork in before a bite. Some of the healthiest options to bump up a salad are chickpeas, peas, carrots, nuts and seeds (non glazed), and boiled egg. If you want to kick up your salad, try adding some wasabi peas, or jalapeno. If you want to give your salad some summer sunshine, try adding citrus or mango. For the healthiest salads, stick with kale, chard or spinach, iceberg lettuce has the least nutritional value, and romaine is somewhere in the middle.